Use this workbook to review and practice important dental assisting tasks! 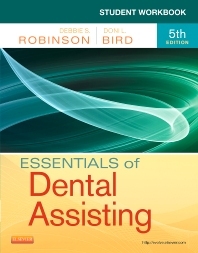 Corresponding to the chapters in Essentials of Dental Assisting, 5th Edition, this study tool helps you understand and apply the material with review questions and exercises, along with competency sheets that outline the steps necessary to mastering each procedure. Developed by dental assisting experts Debbie S. Robinson and Doni L. Bird, this workbook includes removable flashcards for quick, convenient, on-the-go review. Objective-style questions – true/false, short-answer, fill-in-the-blank, and labeling – make it easy to review, practice, and apply dental assisting principles. Competency sheets are included for all procedures, each outlining the performance objective, grading criteria, and steps necessary to master the procedure.